In February, Christine Scott started sharing childhood segments of her life with her mentally disabled sister, Laura. It’s been inspiring to get a child’s perspective on her family’s caregiving journey and the trials they had to withstand. The first segment of Laura’s Story, recounts her birth and slow development. In Part 2, Christine recalls the impact of Laura’s seizures and in Part 3, Laura’s fight with cancer. Part 4, reveals how Christine, at age ten, learned about the accident which lead to her father’s death and Part 5, recognizes the community of angels who helped her family get through their darkest days. Christine has agreed to share a few more insights on the challenges and rewards of growing up in a caregiving household where another family member requires so much of the care due to health issues and concerns. To be honest, I want to be finished writing Laura’s Story—and I don’t want to dwell on the next segment because it was such a difficult time in my life. When sitting down to write this, the sadness and loss makes me tired. At this point, I wish the story took a happy twist and I could report on how we all lived happily ever after. However, this story isn’t one of my works of fiction and processing the hardships I experienced is an essential part of my recovery process. Not to mention—many of you have expressed your interest in finishing the story and I don’t want to let you down. We lived with my grandparents for six weeks after my dad died and then we moved into a rental house around the corner. My mom wanted to stay close to her parents so she could lean on them and have help raising us. My fondest memory of this house was the crab apple trees planted in front. My grandma would have me pick the crab apples, and then she’d make the best jelly out of them. However, I struggled with the move. The kids at my new school weren’t as friendly as in Morgan. And the kids in the new neighborhood openly made fun of Laura, which didn’t seem to happen as much in Morgan. I missed riding horses with my friend and the bike rides from one end of the Morgan valley to the other. I dreadfully missed living in a small town where there were wide open spaces and next to no traffic. I still do. Some things you never grow out of. About a year after my dad died, my grandma was hospitalized for pneumonia. After she was released, my grandpa had a minor heart attack and was hospitalized. A few days later they were getting ready to release my grandpa from the hospital and when my grandma and mom arrived to pick him up, they discovered he had sustained a major heart attack. When the hospital staff approached my grandma to sign the paperwork to treat him, she collapsed. My family always assumed she had suffered a stroke. She was admitted to the hospital. The doctors operated on my grandpa and put in a pacemaker, but his heart was too damaged. He passed away a few hours later. Grandma was unable to attend his funeral due to her hospitalization. My mom had moved close to her parents for their support, but within a short year, the situation had reversed and she was the one helping them. Mom rose to the occasion and pulled through even more challenges—once again proving her strength and resiliency. Much of my baby brother’s care fell to me. Laura had reached puberty, which threw her seizure medications off balance so she started having seizures again. A few weeks ago while reminiscing with my mom about this time in her life, expecting to hear about her struggles, I was surprised by her positive attitude. We discussed the family trip we took to Disneyland shortly before my grandpa died. It was a trip my parents had planned to eventually take, but with my dad’s business struggles there had never been enough money. At this point my mom’s financial situation had significantly improved due to the royalties she had received for my dad’s hang glider plans. So she decided it was time to take her dream vacation to Disneyland. My grandpa didn’t want my mom to go alone, so he and my grandma accompanied her. My mom packed us all up in her Ford Granada and we headed to Anaheim, California. I remember being excited about staying in hotels and swimming. I loved Disneyland and was completely disappointed when grandpa insisted we leave before dark. My mom loved this trip. It is one of her fondest memories of my grandparents. Speaking with her about the Disneyland trip made me remember the trip my family took to Lagoon on the Sunday before my dad died. It was a mild fall day and the lines for the rides were short. We were able to go on our favorite rides as many times as we wanted. My dad was attentive to my family and mom was happy. It was day I wished would never end. As I relived these memories with my mom, I realized that these times we have with our families are precious gifts that transcend the challenges and heartaches. It is when we are together and for a brief time, when life is in rhythm and we feel at sync with the life around us. These moments are beautiful gifts and evidence of Heavenly Father’s hand in our lives—and when remembered—outweigh the grief. Thanks Christine for sharing another segment of your life with Laura and your family’s caregiving trek. When I read this article, the importance of taking time to play with our families is what stood out to me. As a caregiver it’s easy to feel like you don’t have the time or the money to so. Good memories are important, as you have so eloquently described. A break from responsibilities is essential for the family’s well-being. I’m grateful for the reminder. In writing The Value of Testing article, I gained a new perspective of the purpose and benefits of trials. Every day Mark was continually being evaluated physically, mentally and emotionally. The assessments pointed out what abilities he retained and what he needed to relearn. The information directed the doctor and therapists in helping him through the rehabilitation process. The necessary painful and difficult analysis of his capabilities often left both of us feeling discouraged and overwhelmed for what he’d lost. During this hard time I was going through a personal examination of commitment, faith, endurance and strength. 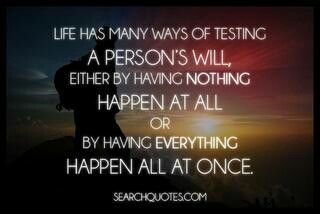 As I reflected on Mark’s and my own trials, it became clear to me that life is continually testing us. Sometimes we feel alone in our trials and wonder why we’re not getting the help we need or the answer from God. However, in the silence and loneliness, we often learn the most. As I remember, a teacher is always quiet during the test. Life is constantly teaching us something if we just pay attention. Through self-evaluation we can learn what areas we excel in and where we need to improve. A few other tips I found on life’s lessons are shown in these images. Illness teaches me to appreciate good health and prompts me to take better care of myself and those around me. Suffering teaches me the importance of service and giving relief to others. Death teaches me to be grateful for life and the love shared with others. Grief teaches me empathy for others and helps me connect with them on a deeper level.